We’re not the only roofing and siding company in Edmonton who can give you the quality and service your home deserves; however we like to think there’s no one better – no one who can give you the same combination of quality, professionalism, and value that we offer. 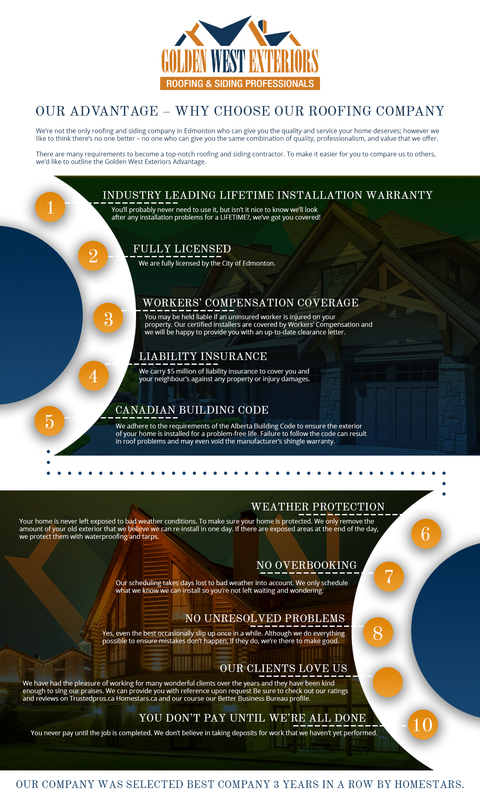 There are many requirements to become a top-notch roofing and siding contractor. To make it easier for you to compare us to others, we’d like to outline the Golden West Exteriors Advantage. Industry Leading Lifetime Installation Warranty – You’ll probably never need to use it, but isn’t it nice to know we’ll look after any installation problems for a LIFETIME?, we’ve got you covered! Fully Licensed – We are fully licensed by the City of Edmonton. Workers’ Compensation Coverage – You may be held liable if an uninsured worker is injured on your property. Our certified installers are covered by Workers’ Compensation and we will be happy to provide you with an up-to-date clearance letter. Liability Insurance – We carry $5 million of liability insurance to cover you and your neighbour’s against any property or injury damages. Canadian Building Code – We adhere to the requirements of the Alberta Building Code to ensure the exterior of your home is installed for a problem-free life. Failure to follow the code can result in roof problems and may even void the manufacturer’s shingle warranty. Weather Protection – Your home is never left exposed to bad weather conditions. Alberta’s weather is unpredictable and we know we can’t afford to take chances with your home. To make sure your home is protected. We only remove the amount of your old exterior that we believe we can re-install in one day. If there are exposed areas at the end of the day, we protect them with waterproofing and tarps. No Overbooking – Our scheduling takes days lost to bad weather into account. We only schedule what we know we can install so you’re not left waiting and wondering. No Unresolved Problems – Yes, even the best occasionally slip up once in a while. Although we do everything possible to ensure mistakes don’t happen, if they do, we’re there to make good. Our Clients Love Us – We have had the pleasure of working for many wonderful clients over the years and they have been kind enough to sing our praises. We can provide you with reference upon request Be sure to check out our ratings and reviews on Trustedpros.ca Homestars.ca and our course our Better Business Bureau profile. You Don’t Pay Until We’re All Done – You never pay until the job is completed. We don’t believe in taking deposits for work that we haven’t yet performed. Our company was selected best company 3 years in a row by Homestars. Please click here for more information.